Sorry for the lack of posts these past few days, it was a crazy weekend and I have a cold I just can’t seem to get rid of! 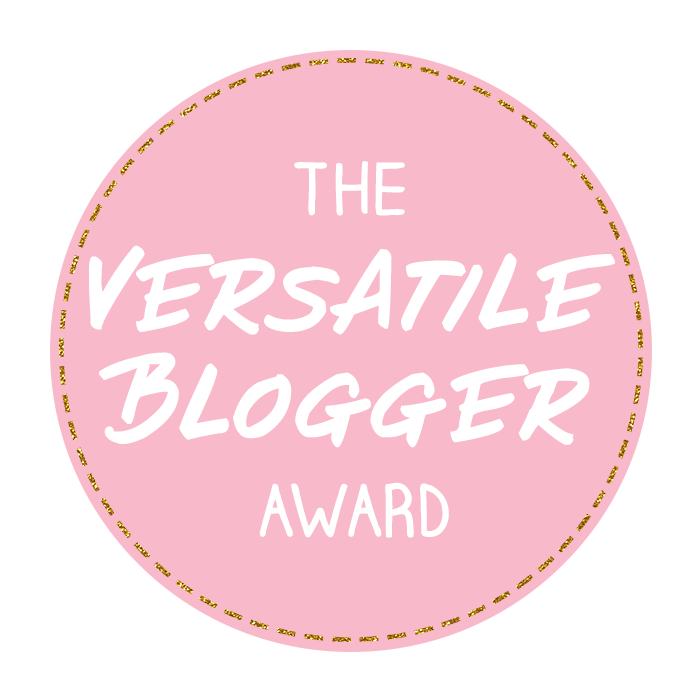 This post is a little late, but I’ve so kindly been nominated for the Versatile Blogger Award by the lovely girls at Louie and Coco, Nature of Happiness, Angelina Rose, and Happy Dreamers! Thank you all so much! -I’ve lived in Ohio my entire life, except for the three months when I lived in London. -I’m constantly trying to find a way to move back. -I absolutely love Disney World, I’ve visited seven times and went to Disneyland Paris once. -I met the majority of the cast of Full House (minus Mary-Kate and Ashley) in Disney when I was four. -My favorite films are the Lord of the Rings Trilogy, I used to watch them everyday after I got home from high school and wear the one ring around my neck, yes I’m that cool. -I love doing ancestry research. -I nearly broke an ankle running down the steps after my favorite actor Tom Hiddleston told me Happy Christmas on twitter. I would have felt no pain. Thanks again for the nominations and I hope you’re all having a lovely week! I actually think i’m one of the few people that weren’t born with a Disney side lol. I love family ancestry too, we ran into a couple of dead ends and intriguing tales of illegitimate children in the early 1900’s along one side. My great grandad was sent to a city in a grand old carriage and adopted by a family, there were rumors of him being a son of a wealthy Londoner and that this adoption was organized by members of the clergy to clear and hush everything up. Everyone who knew the secret would never tell or destroyed all the papers. I hate running into dead ends with ancestry! Oh wow that’s so amazing, yet so frustrating that all the proof is gone! I’m at a halt in most of my research because I have to start traveling to the different states to find the paperwork. But I’m pretty sure that I found proof of how my parents are distantly related, haha! I know we’re all related, but to find out how is such a cool thing to me! i LOVE WDW! i have been there 10 times and have been to DL 4 i think. i want to see them all!! i was at mk last month and am counting down until my next trip! It really is just such a magical place!! I want to visit Disneyland so badly! Heck I want to see them all too! The one in Tokyo looks like so much fun! I’ve always wanted to work at Disney just so I can be there all the time, haha! Thanks for the nomination! I hope your cold goes away soon!!! I absolutely HATE being sick, you forget just how amazing it feels to be normal haha. Just get a job in London and voila! Or work for a company that has offices in London, that way you might have to visit with ability to transfer in the future. Just a thought ..
Also, I tagged you in my post / campaign, hope you get a chance to read it. What Will You Take Back? Post. You’re so welcome! Ugh this cold really is trying to hang on as long as possible! I can’t wait to be able to breathe through my nose again, haha! Ahh I wish, it seems that most places won’t hire Americans since they’ll have to pay more. But I’m hoping I’m able to find some company that has offices in London! I’m not sure what exactly, but fingers crossed! Hahah my sister always falls asleep during them! I just love the feeling of being transported to another world! And thanks again for tagging me in your post! I’m going to working on mine soon! It’s such a lovely idea! Thank you so much for the nomination! This is a new award, right? I like that it's not quite as strict as the Liebster, haha! You’re so welcome! I just realized I forgot to actually let everyone know they were nominated, lol, that’s what I get for blogging while sick! Yep it’s a new one! Technically it had a certain number to nominate, but I just decided to take that out, haha!